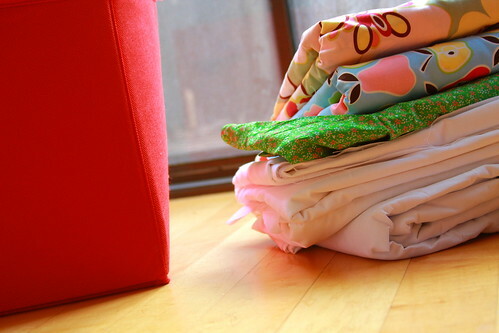 Once I got into it I was amazed at how much fabric I have accumulated over the last 4 months, yup 4 months! I have sewn all of my life but would only buy fabric when I needed it. I NEVER bought something just because I like it. Well.......that is not true anymore. I didn't fold mine perfectly but the selvages are turned in and it is all by color. The red bin is for all of my scraps. I just recently started to keep my scraps because in the beginning I did not want all of these little pieces around the house, but I have learned that they all have a purpose. The stack is the yardage I have that is over 4 yards each, for now I just put them on top of the red bin (see the pic below). I took my stash into my kitchen to organize and take pics. The kitchen has the best light and the most room, but I want you to see where I actually keep my stash. Yup, next to my nightstand. It really is the only place to keep it. 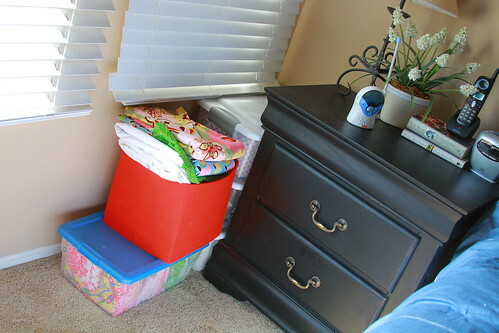 I do not have an extra room to sew and I am jealous of anyone who does. I sew on my kitchen table as that is the only available space, let alone table. Blah - that's why living in small SoCal spaces is no fun! I should post a picture of where I sew...I'm split between 2 rooms, partly because Steve needs half the kitchen table to work on homework! I'll have to take pictures :) Maybe people who have big houses will better appreciate their space! yayyy to having your stash organized!!! that's such a good feeling!!! well fabric has to live somewhere!!! yeah, good for you and you have some yummy fabrics!! That is really a great stash...and in only four months! I love your fabric! Nice job! I guess I am not the only one who has limited space to sew!!! i'm so like you...i've been sewing forever, but it's just been a year that i've been quilting and felt the need to have a stash...i wonder if yours will look like mine in 6 months? i also used to throw my scraps...no longer. i love my color coded scrap boxes!! I have a dedicated sewing room...but I still sew at the kitchen table. Dining areas always seem to have the best light. we live in the same exact house so i sew on the kitchen table...BUT troy rigged an ironing board up last week and lowered it so i could sew sitting on the couch in front of the tv. it was HILARIOUS but sooo useful! I love how neatly organized it is. I have an actual cabinet, but it's not neatly folded. My sewing time is limited, I don't want to waste it folding! I wish you had more room to sew! 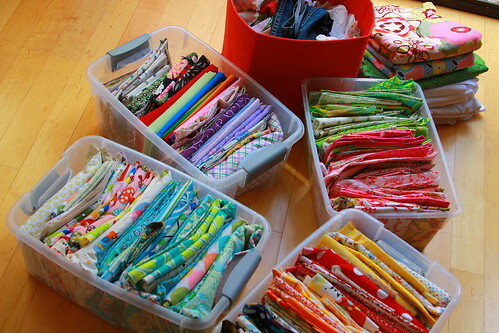 you have a great fabric stash, looks so nice and neat! You have a great fabric stash. 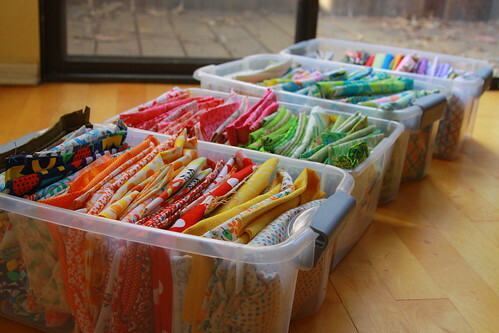 but i love how you have organised your fabric stash.